Everyone wanted it and now it’s happening. 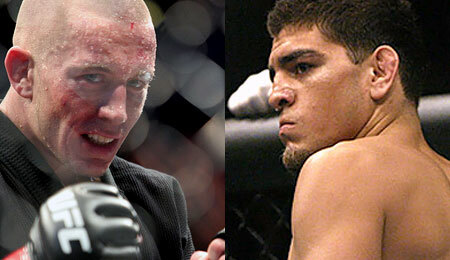 Georges St-Pierre will face Nick Diaz in a UFC welterweight title fight at UFC 137 on October 29 at Mandalay Bay in Las Vegas. UFC President Dana White made the announcement via his Twitter account on Wednesday. MMAWeekly.com first reported the bout between St-Pierre vs. Diaz as being a work in progress, and that an announcement was forthcoming about the proposed fight. While the actually announcement took a few more days, now it’s official. Last weekend, UFC President Dana White stated that there were still a few roadblocks in the way of creating the super fights between the UFC and Strikeforce. It appears now at least one of those roadblocks was cleared, and St-Pierre will indeed face Diaz in the Octagon. St-Pierre has virtually cleared out every other top night in the welterweight division, but one name still remained and Nick Diaz was that person. Diaz has reeled off 10 wins in a row and most recently knocked out former UFC welterweight Paul Daley in Strikeforce. Diaz will now move back over to the UFC where he called the Octagon his home for 9 fights, except this time he’ll be challenging for the welterweight title against one of the best pound-for-pound fighters in the sport.